The flickering light of labradorite is a dance of glimmering color unique to each stone. 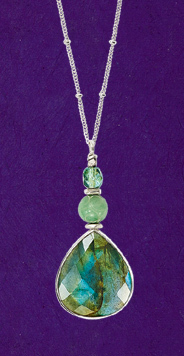 Dramatic faceted labradorite pendant, accented by jade and Czech glass beads, is held in sterling silver. Natural stone, colors will vary widely. On 18" chain. Made in USA by Lynn Olander.